We all know the basic story of how one Victor Frankenstein created a monstrous being. Even those who have never seen a Frankenstein movie can easily summarize the story. 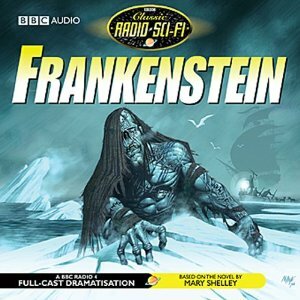 However, many who go back and read the original novel by Mary Shelley are shocked at what they find. Contrary to what pop culture says, there is no hunchback assistant named Igor, the accidental use of an abnormal brain in the creation of the monster or burning windmills of any kind to be found in the novel. In 1994, the BBC decided to capitalize on the interest in the novel generated by Kenneth Branagh’s film adaptation by creating an all-new, two-part radio drama presentation. The resulting work was not only very faithful to the novel, but it also ran rings around Branagh’s supposed faithful adaptation! Granted, there were some small changes made, such as a flashback to a young Victor Frankenstein goofing around with his friends or the claim that a tree that was struck by lightning had some of its wood become ironlike, but overall it’s almost exactly like the book. Even the use of letters written by Captain Robert Walton, who encounters both Frankenstein and his creation over the course of his journey to the North Pole, is preserved as a way to act as scene transitions. However, this (and the narrator who appears at the beginning of each installment) are the only part of this adaptation that come remotely close to resembling an audio book. Whereas the book’s Walton notes working with sailors in his letters, the dramatization lets us hear said sailors talk amongst themselves, along with the clank of chains as they load the ship. Although they are baffled to see a huge man on an ice flow during the course of their journey, we the listeners know full well who it is. Similarly, the identity of the haggard man they rescue later on is no surprise, nor is the story he tells of why he’s pursuing a giant among the frozen wasteland. Frankenstein moves along at a fairly speedy pace; it’s not too fast, but never dwells on a scene for too long. The acting is excellent and I was especially surprised by the actor portraying the creature. What I found most interesting is how he chose to have the creature’s voice change and adapt as the story progressed. Initially only able to babble, its voice improves as it learns and adapts and eventually becomes forceful in tone (and with something of an accent). When it howls with rage, the creature sounds very close to its portrayal in Famous Monsters Speak and at some points, he sounds quite similar to the voice of the original Mumm-Ra! But no matter what voice he utilizes, he successfully alternates between sympathetic and unnerving when the situation calls for it. With the exception of a scene involving a mule, the sound effects were great and the animal effect of mule is pretty bad and the music is used sparingly (but effectively). The hour and 53 minute production is spread out over two discs, which are packaged with some extremely informative liner notes. Not only do they detail the creation of the novel (including the revisions made to first three printings), the various film and radio adaptations and how this particular adaptation came to be. According to said liner notes, this is the first CD release of this title and the first home media release of this since 1997. There’s also reproductions of the ads used to promote the original airing as well. Some might question why one who has already read the novel want to listen to a near-perfect audio adaptation of said novel. In addition to the fact that it’s a fun way to revisit it, the audio nature of this version makes it impossible for the person revisiting it to unconsciously skim through. That makes it much easier to notice parts of the story that you may have missed before. For example, I had completely forgotten how Dr. Frankenstein tried arguing with his creation that there was a very good chance that his intended mate would reject him and go on a rampage until I had listened to this. I had always thought Frankenstein was a fool for assuming that any offspring between the two would be anything other than a normal human (thus making his cold feet on the matter unreasonable), but hearing those points changed my mind. While I highly recommend this to those who haven’t read the novel, I also recommend they seek out and read the original as well. You just might be surprised at what you learn.